Boston Town should travel to Harborough with nothing to fear. That is the view of manager Gary Frost, who believes his Poachers can be more than a match for their highflying hosts. 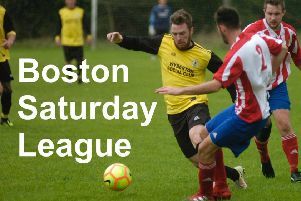 Harborough sit fourth in the United Counties League Premier Division, nine places above Boston. But Frost has faith in his squad, who he believes are good enough to be challenging much higher up the table, if they can just put their inconcistencies behind them. Saturday’s defeat at Rothwell Corinthians ended Town’s good run of form, which had included five wins from six matches. But Frost is confident the winning mentality can return. “I don’t see why we have anything to fear,” he told The Standard. “They’re a good side, they’re up there. “But I don’t think there’s a lot between a lot of the teams in the division. “We’ve been inconsistent at times and I want us to get back to how we were on our good run. Boston will be without suspended defender Craig Parker, who was sent off against Wisbech last week, and the unavailable Duran Reynolds. Harborough’s last match was a 4-1 win at struggling Oadby. But before that they had lost their previous two home league fixtures 4-0 against both Cogenhoe United and Wellingborough Town. Town will follow this up with a trip to Yaxley on Tuesday (KO 7.45pm). The Cuckoos sit a place and six points above Town. The two rivals played out a 2-2 draw at the DWB Stadium in October.